U.S. President Donald Trump says he is considering canceling his scheduled meeting with Russian President Vladimir Putin at the Group of 20 (G20) summit in Argentina this week over Russia's detention of Ukrainian sailors. His comments in an interview with The Washington Post published late on November 27 came as the Ukrainian president warned of a "threat of full-scale war" with Russia while European leaders said they were considering a new round of sanctions against Russia because of its capture of three Ukrainian naval ships and their crews following a confrontation at sea off Crimea on November 25. Trump told the Post he was awaiting a "full report" from his national security team about the incident before going through with a Putin meeting that had been expected to address a range of issues from arms control to the conflicts in Syria and Ukraine. "That will be very determinative," Trump told the Post. "Maybe I won't even have the meeting ... I don't like that aggression. I don't want that aggression at all," he said. 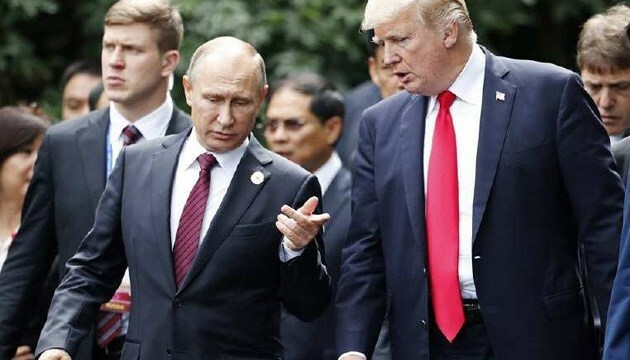 Trump was due to meet Putin on the sidelines of the G20 summit in Buenos Aires on November 30 and December 1. His comments came after a Russian court on November 27 ordered 12 of the 24 Ukrainian sailors who were captured by Russian forces to be held in custody for two months. Russia has claimed that Ukraine provoked the naval clash in what it has called its "territorial waters" near Crimea, which Moscow forcibly annexed from Ukraine in March 2014 in a move not recognized by most nations. Ukrainian President Petro Poroshenko warned late on November 27 that the conflict threatens to turn into a "full-scale war," citing Russia's "dramatic" build-up of forces in the area. "I don't want anyone to think this is fun and games. Ukraine is under threat of full-scale war with Russia," the president said in an interview with Ukrainian national television. "The number of [Russian] units that have been stationed along our entire border has increased dramatically," he said, while the number of Russian tanks has tripled. Poroshenko a day earlier won the Ukrainian parliament's approval to put parts of Ukraine they deemed vulnerable to attack from Russia under martial law for 30 days. The clash between Russian and Ukrainian forces in waters near Crimea was the first in that arena after more than four years of war between Kyiv and Russia-backed separatists in eastern Ukraine that has killed more than 10,300 people. It followed months of growing tension over the waters in and around the Kerch Strait -- the narrow body of water, now spanned by a bridge from Russia to Crimea. That strait is the only route for ships traveling between the Black Sea and the Sea of Azov, where Ukraine has several ports, including Mariupol. European Union leaders said they were considering ratcheting up sanctions on Russia for illegally blocking access to the Sea of Azov over the weekend and because of its defiance of calls to release the Ukrainian sailors. Karin Kneissl, the foreign minister of Austria, which holds the rotating EU presidency, said that the bloc will next month consider further sanctions against Moscow. "Everything depends on the accounts of events and the actions of both sides. But it will need to be reviewed," Kneissl told reporters. Norbert Roettgen, a close ally of German Chancellor Angela Merkel, said the EU may need to toughen its sanctions against Russia, while Poland and Estonia called for more sanctions. Estonian President Kersti Kaljulaid said Russia's actions constituted "war in Europe," adding that this "will not, shall not, and cannot ever again be accepted as business as usual." She urged the international community "to condemn the Russian aggression clearly, collectively and immediately and demand a stop to the aggression." U.S. State Department spokeswoman Heather Nauert said EU countries should do more to support Ukraine, suggesting they reconsider their support for the Nord Stream 2 gas pipeline between Russia and Germany, which she said "helps the Russian government." "The United States government has taken a very strong position in...support of Ukraine. We would like other countries to do more as well," Nauert said. "Many governments have imposed sanctions on Russia for its actions in Crimea, in Ukraine. Not all of those sanctions...have been fully enforced," she said. The Kremlin said Putin repeated Russia's position that Ukraine provoked the incident In a conversation with Merkel on November 27, and expressed "serious concern" over Ukraine's decision to impose martial law in regions that border Russia or Moldova’s breakaway Transdniester area, where Russian troops are stationed, or have coastlines on the Black Sea or the Sea of Azov close to Crimea. Putin said he hoped "Berlin could influence the Ukrainian authorities to dissuade them from further reckless acts," the Kremlin said.